Federal employees and contractors who aren't getting paid because of the shutdown are lining up for free, hot, gourmet meals from the charity founded by Chef Andres. The kitchen is set to be open every day from 11 a.m. to 6 p.m. until the partial government shutdown ends. 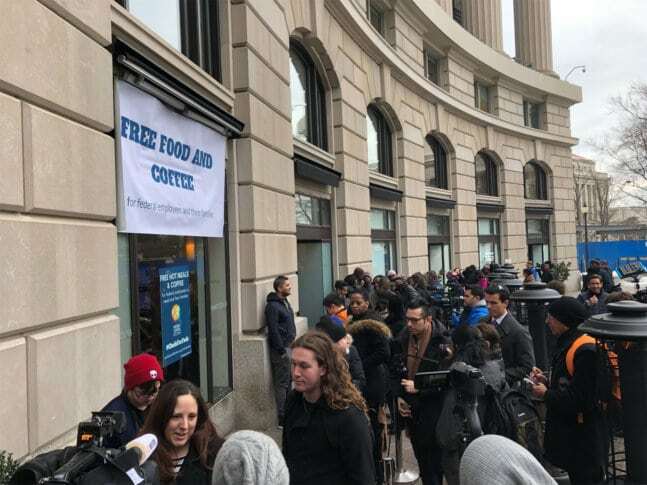 WASHINGTON — Federal employees and contractors who aren’t getting paid because of the shutdown are lining up for free, hot gourmet meals from the charity founded by Chef Jose Andres. “This is what we do. We provide fresh, hot meals to people in need,” said Nate Mook, executive director of World Central Kitchen. The goal is for the kitchen to be open every day at 701 Pennsylvania Avenue in Northwest D.C. from 11 a.m. to 6 p.m. until the shutdown ends. “We are supported by private donations. But, we are hopeful that we can be here as long as we’re needed and the federal employees can get back to work. Because that’s what they want to do; they want to get back to their jobs and they want to receive their paychecks,” Mook said. Serving a rotating menu of hot meals, sandwiches, and salads — the offerings on opening day on Wednesday were toasted ham and cheese with fried egg and roasted garlic aioli, a quinoa power bowl packed with gourmet ingredients, and roasted fennel and tomato soup with toasted pine nuts. “This felt like somebody cared,” said Rebekkah of Sykesville, Maryland who is furloughed from the Federal Aviation Administration. “He has a big heart,” Jim’s spouse Sharron chimed in. “He cares about, he realizes the individuals are the one’s getting hurt by this,” Sharron said of Andres. “Whether it’s a natural disaster like a hurricane, or an earthquake, or a wildfire, or a man-made disaster — ultimately folks are struggling,” Mook said, explaining why the charity opened cafe doors in D.C.
Rebekkah noted that you might not think a chef could do anything to help in a partial government shutdown situation but said she’s happy Andres is using his talents to bring people together. “It’s nice to be able to come into town and meet a friend and have lunch and do something I couldn’t afford to do otherwise,” Rebekkah said.